"This diagram was meant as a challenge to the prevailing art world hegemony. It was created to prove the argument that graffiti and street art were already at the center of the art world whether they were officially recognized or not. Utilizing the same graphic vocabulary as Alfred H. Barr, Jr (the first director of MoMA for the cover of the catalog for Cubist and Abstract Art exhibition in 1937) to create an impression of authority equivalent to his diagram. The Feral Diagram picks up chronologically where Barr left off, thereby subverting and redirecting the officially recognized historical trajectory. 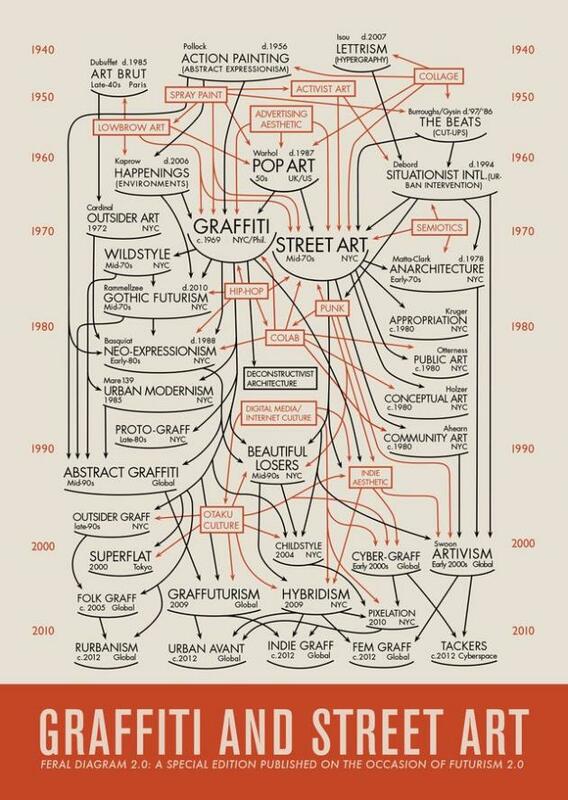 Six years after the first draft of this diagram, the acknowledgement of graffiti and street art as important movements within the fine art community, if not the most important movements at the beginning of the new millenium, has come to light with major museum retrospectives, a never ending stream of books on the subject, websites, products, etc." Fig.1 revised "Feral Diagram 2.0" version. 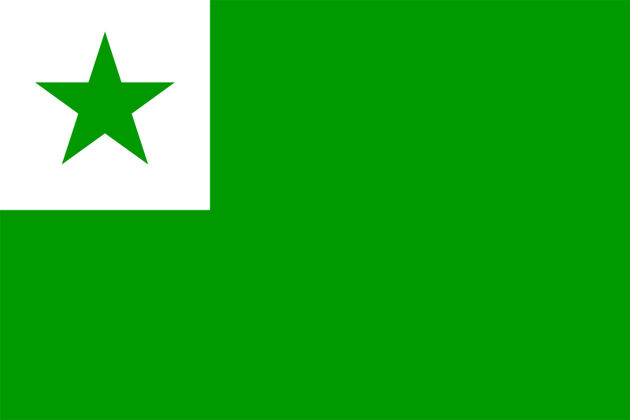 Does the world need Esperanto? "[Esperanto] was very much the child of its times, like Theosophy, perhaps, or even Communism, which explains both its rapid spread in the early part of the 20th century as well, I think, as its eventual failure, if that's the right word, to live up to the hopes of the hopeful [Dr Ludwik Zamenhof], the founder of the movement. It's also unsurprising that after the nightmare of the first world war, so many people around the world were inclined, in an era of modernism, to imagine peace in universalist terms. A century later, we live in a rather different world, one where diversity (in dialects, ethnicities, customs, beliefs) is widely celebrated as a very fine thing, while anything that smacks of a grand narrative (a universal truth, a universal movement, anything hegemonic) is regarded with suspicion, although not universally, naturally." It is important to recognise from the outset that communitas does not represent for Turner some ideal state of community which is only lost or subjugated through the prevalence of hierarchically organised social structures. The latter are patently necessary, and communitas as such only persists in their midst, au milieu. In Turner's words: "communitas is made evident or accessible, so to speak, only through its juxtaposition to, or hybridisation with, aspects of social structure."(Turner. 1995) This is to say, it does not require the destruction or collapse of social organisation, but takes place only within such a context and despite its hegemony. It exists only in the relation of 'coincidentia oppositorum' with social strata. 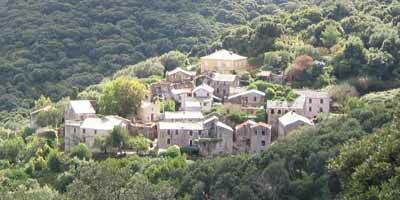 Communitas is attributed several important qualities which mark its distinction from engineered community. It is existential, or in Deleuze and Guattari's terminology, 'territorialised', in the sense that it is not constituted by means of deterritorialized structures or ideological goals. It embodies or enacts potentialities yet to be stratified or incorporated into hierarchical structures. It is spontaneous in the sense that while it may be made manifest by ritual practices, its composition and effect are not foreseen, nor imagined to be easily incorporated into social organisation. Finally it is associated with experiences of liminality, marginality or structural inferiority which effect a temporary suspension of the hegemony of structure.